Most of us as vegetarians and love fruits and vegetables in our daily diet. Have you thought about sea vegetables available? One of the important and key sea vegetables to be included in your diet is Kelp, a type of seaweed full of nutrients and have amazing health benefits to prevent various diseases and serve various beneficial nutrients. It is commonly eaten in Asian countries including Japan and China. 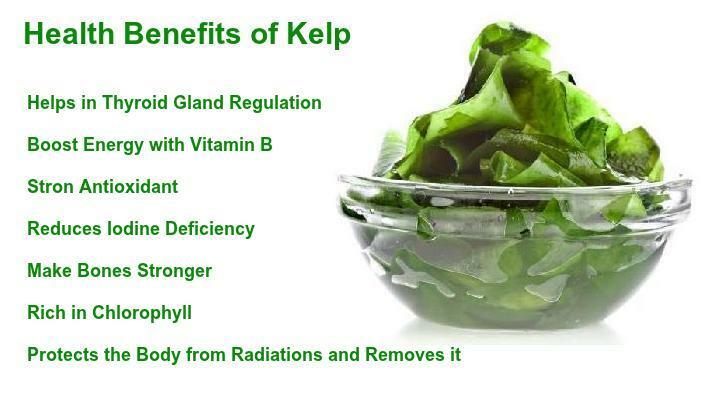 Let’s see amazing Health Benefits of Kelp here. Kelp is a type seaweed, a large brown seaweed that grows in shallow, nutrient-rich saltwater, near coastal fronts around the world. It differs in color, nutrient, and flavor profile from the type you may see in sushi rolls. It can grow up to half a meter a day and is mainly found in Kelp forest in shallow bodies of sea water. Kelp is rich in vitamins, minerals, trace elements and enzymes as it absorbs the nutrients from its surrounding marine environment. It has prominent nutrients like iodine, salt, iron, potassium, phosphorus and calcium. The lead vitamins in kelp are vitamin A and niacin. Due to Kelp high levels of natural iodine, it is essential in regulating our thyroid hormones and therefore our metabolism and energy levels. Kelp contains vitamins B which is essential for cellular metabolism and providing your body with energy. It contains vitamins C and E, which are both strong antioxidants and promote blood vessel health. Seaweed is also a rich source of iodine, which is a crucial nutrient for the thyroid. A deficiency in iodine leads to goiter or swelling of the thyroid, and metabolism disruption. Consuming iodine from plants like kelp also helps reduce the effects of radiation exposure. Minerals, such as calcium, boron and magnesium are plentiful in kelp; they are necessary for strong bones and normal muscle function. Kelp, like other seaweeds, is rich in sodium alginate, which is an element effective at protecting the body from radiation and removing it. Sodium alginate derived from kelp reduced radioactive strontium absorption in the intestines by 60 to 80 percent. Specifically, sodium alginate allows calcium to be absorbed through the intestinal wall while binding most of the strontium, which is excreted from the body. Chlorophyll is also similar in composition to human blood, so consumption of it can stimulate red blood cell production, which can increase oxygenation around the body. Kelp contains plentiful amounts of chlorophyll.